If you've been to Kohl's, you've likely seen the Kohl's Cares line. Did you know though, that 100 % of the net profits from the sales they get from those items is donated to benefit children's health initiatives nationwide? 100%. I think that's amazing. The summer line is now out, and available through June 26th. Each item in it is just $5.00. You'll find cute items like the Found book you see above, and the Bear Soft plush. I "found" the dinosaur soft toy reading the Stormy Night book that features both he and his bear pal in it. When you come across a dinosaur reading at the kitchen table, it's bound to make you smile. I know that to be true... I tested the theory with the kids. :) And do you see the dino's price tag in the picture? Yep...just five bucks. Like I said, that is what each and every one of these items costs in the Kohl's Cares collection, always. I love that because it allows more people to participate, and that means more help for the children. I know if I'm in Kohl's for even just a quick minute, I usually stop and grab one of the Kohl's Cares items to take home. My kids love the plush animals that have a book to accompany them, and I do have to admit, that kind of pairing appeals to me too. My nephew's daughter instantly fell in love with the 3-pk. of little board books that you'll find in the summer line. All three are in the package, and again, it's just five dollars (for the set). You have to love a project that is so beneficial to our youth. What a great way Kohl's has come up with, to make the consumer happy (your kids are going to love any of these products! ), and help those in need. That is great indeed, and you can't top a dino reading at the table. What a wonderful thing they are doing. Wonderful. How cute are these stuffed animals and books. I also think it's wonderful they donate the profit to charity. That is amazing. Good for Kohl's! I hope more stores follow suit. How cute! 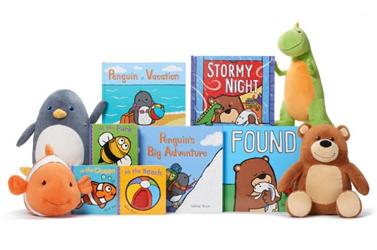 I like the penguin or the fish, & I love that profits go to children's charities! I love supporting companies with good causes! Thanks for informing me of this one! I'm heading to Atlanta to visit my niece and nephew and have been trying to think of what to bring them. These books and plush toys look like the perfect thing. Hope I can fit them in my suitcase. Wow I did not know Kohl's ran such a great program. The toys and the books all look like quality items that my little cousins would enjoy. I have always been a fan of Kohl's Cares. I love and support this program. I love books that are packaged with a stuff toy, it makes reading more fun for kids. I also love the fact that this is going to help a lot of kids in need. Causes like this are close to my heart. Kids should be given the life that they deserve. I love the Kohl's Cares line of products. They always have the cutest items and I love that the proceeds benefit such a worthy cause! Seriously though, I always pick up a Kohl's Cares item every time I visit. Not only do I get a great item for $5 but I know that I'm helping the kiddos too. I am Carol and I am a Kohl's a holic. I love that they do this. 100% is an amazing commitment. Well done Kohl's! I know about their Kohls care, but not fully about the initiative. I'm glad they have this and support the families with kids needing the care. Those are some of the cutest softies I've ever seen! I love dinosaurs and $5 for each of those sound like a huge bargain, not to mention the fact that the money goes to a better place! This is so cute! My kids will enjoy this book. I love that they're giving back, and for 100%, that's even better. I think this is an amazing cause. If I see this in Kohl's I will definitely pick them up for my girls. The Kohl's Cares is a great program. I have purchased many of these toys- books and stuffed animals for the boys over the years! That dino is prety cute. I have seen those and sometimes I buy them as gifts. Love them all. So sad my boys are too old for these now. It is always amazing when big brands & companies step in & give back to the society. I love shopping at Kohl's & it is great to see them donating 100% of their net profits to benefit children's health initiatives nationwide. This is indeed awesome ideas for any child. I love the plush animals with the books and I know they would be perfect for my nieces kids along with my sister's son. Kudos to Kohl's for donating 100% of profits to donated to benefit children's health initiatives nationwide. Thanks for sharing the great review and the cause. What a great cause! Plus that dino is super cute. I have to say I've been following this program with Kohl's for a few years now and it's always great from year to year. Thank you for sharing with your readers! Yes, I love Kohls cares. I always stock up on stuff for the boychild. He is obsessed! What a great cause. Hope many will participate at this! I love kohls cares. we buy a lot of their books. my kids love them so why not, and it's for a great cause! I don't shop at Kohl's but this is an awesome cause, I love it! The plush toys that go with the books are so adorable and they look so soft! My grandsons would love to own these cute sets! Kudos ko Kohls for doing such a nice thing! What they are doing is just so wonderful.